iPhoto is Apple’s step up from the standard Photos app, a photo editing app that adds a lot more options to add effects, tweak photos and create slideshows and photo books. It’s seen a big redesign and retune for iOS 7, and damn was it needed. The old iPhoto app was dreadful: ugly, over elaborate and downright confusing. It’s a free download for any new iPad or iPhone, so it’s a risk-free acquisition. But has Apple mended the mistakes of the Forstall-era? The first signs are promising. The iOS 7 style is in strong effect here and, visually at least, it’s a vast improvement on the iPhoto of old. It looks and feels fresh, modern and uncluttered. This starts with the opening screen, which splits things into three categories: Photos, Albums and Projects. Photos and Albums are straightforward enough, with the Albums section including an album for images edited in iPhoto. The third section, Projects, is where you go to create Web Albums, shareable Slideshows and Photo Books – we’ll return to these a bit later. Tap on any photo and you’re transported to the editing screen. By default there’s a ‘filmstrip’ of your other photos along the bottom so you can switch quickly, and basic options like auto enhance and tags. You have to hit the tools button, however, to get to the real editing tools. The basic tools haven’t changed much, comprising Crop, Exposure, Colour (it’s even spelled correctly) Brushes and Effects. Vitally, and this is a small but also huge improvement on iPhoto 1.0, each tool is actually labelled rather than being nameless icons. This makes it so much easier to identify them at a glance, rather than having to decipher them based on the icon. Gone, also, are the dreadfully fussy ‘real life’ animations, which were clunky, ugly and slow. The tools are, for the most part, easy to use and offer a great range of tweaks. But it’s not instantly intuitive. It took us around 30 minutes of experimentation to feel comfortable with all the controls, with liberal use of the help toggle that overlays directions and labels on-screen helping. Naturally it’s optimised for the iPhone 5S and its 64-bit processor, and there’s no doubt it’s blisteringly fast. Once you’re up to speed you can produce some excellent results. The crop tool is particularly good as it makes it easy to adjust poorly lined up landscape shots, or create ‘jaunty’ angles just by tweaking the dial. The number of effects is comprehensive, while the ‘Brushes’ option makes it easy to clone out blemishes and adjust specific parts of the photo without affecting the rest of the shot. There’s still room for improvement, however. For example, while the iPad version of iPhoto has a dedicated ‘Undo/Redo’ button, the iPhone one does not. Instead the option is tucked away inside another drop down, which is less intuitive and disconcerting for novice users. iPhoto is still infuriatingly unclear about how changes are saved and stored, too. It ought to be clearer that all changes can be reverted in full and edited photos can be saved as separate photos, but you’re left to work this out for yourself. It’s a needles pain point for novice users. Elsewhere, the Projects section is something of an oddity. Online web albums and slideshows feel like a rather anachronistic way to share photos in the age of Facebook, Twitter and Flickr (hell, the latter one feels a bit old hat), so it’s hard to feel excited about these features. applied a light ‘oil painting’ effect. The Photo Book section is slightly more interesting as it lets you design, tweak and order a photo book to deliver to your door. We’re sure there’s cheaper ways to do this, but there’s no denying it’s fast, easy to use and kind of ingenious that it can all be done in 20 minutes on your phone. It’s not for us, but it might be for someone, and you can easily share photos to Facebook et al if that’s more your bag. There are still some rough edges in iPhoto. It lacks the intuition of Snapseed or the instant gratification of Instagram, but it packs in some advanced options in a mostly easy to use package. Free or not, it’s a big improvement on the old version and well worth a download. 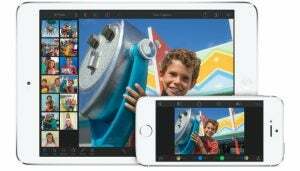 The post iPhoto for iOS appeared first on Trusted Reviews.